Alanda December 14, 2014 2 Comments This post may contain affiliate links. These are super easy and a lot of fun to make so you will want to get the kids involved with this one. 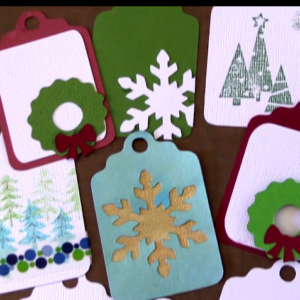 We used the Brother Scan n Cut to cut out some gift tags and Christmas shapes and then glued them together in variety of different styles. They look great and you will have some unique gift cards to attach to your gifts this Christmas. Excellent, so good to hear Claire!